What do you do when you’re a member of a radical direct action environmental organization and the world really does collapse? This is the question at the heart of the story in The Massive as members of Ninth Wave face the world during a massive eco-social-environmental cataclysm. Ninth Wave, easily a stand in for Sea Shepherd, is comprised of an international crew aboard the Kapital and its missing sister ship the Massive. Volume 3 of the trade paperback was released in early July 2014—this review will look at Volume 1 and contain a few possible SPOILERS to that collection. This volume mostly serves as an introduction to the world and characters, so I don’t think I’ll be giving too much of the overall story arch away. 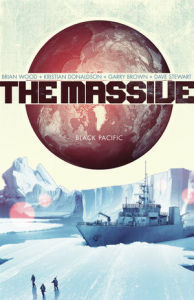 Set in the current era, the cataclysm depicted in The Massive is one of global climate change. Taken as individual occurrences these events could be ripped from the headlines of today: massive storms across the worlds oceans, unusual seismic activity, mass suicides and die offs of marine life, changes to wind patterns, unusual snowfall and changes to wind patterns. The results are worldwide coastal flooding, loss of power to hugely populated areas, and the destabilization of almost all world governments. This happens in less than a year, and perhaps most amazingly, the world actually takes notice. Enter Ninth Wave, the marine conservationist direct action force, led by Captain Callum Israel, ex-mercenary turned radical environmental pacifist. The members of Ninth Wave that we meet in volume one include Mag, a first mate from Sri Lanka; Lars, a Norwegian helmsman; Mary, a Hutu zodiac driver / direct action specialist; Georg, an engineer from Grozny; and Ryan, an American who I can only assume is a deckhand of some sort. Prior to the crash, Ninth Wave conducted operations similar to Greenpeace or Sea Shepherd. They intervened to stop marine pollution, the slaughter of marine mammals, and other human exploitation of the marine environment. Post-crash the reader quickly finds out that they have lost contact with the Massive, the crew of Kapital is fixated on locating this ship, but the loss of contact is a mystery. None of the crew are more obsessed with finding the ship than Cal, and I assume there will be some similarities between Cal’s search for the Massive and Ahab and his white whale. While I have given away a lot of the setting and a little about the characters I will leave the main story alone, and just tell you to enjoy. I will warn that is a story with a slow burn, but based Brian Wood’s prior work, it should deliver. l think it will be a interesting journey. The artwork in this book works very well for me. Where the art really shines is in the larger scale illustrations of nautical scenes and painting a picture of the scale of the environmental catastrophe. Action sequences are done well and the cover art is fantastic. I’d like to collect each individual issue, just for the covers. In fact, the only place where the art is lacking is during some of the dialogue onboard the ship—the bridge of a ship just doesn’t make for that interesting of a backdrop for in depth conversation. But this is easy to overlook. What’s of interest in these books to an anarchist? Well, other than the fact that it’s a post-apocalyptic plot centered around direct action environmentalism, there are a number of interesting topics, notably the discussion of non-violence and holding onto your principles in a destabilized world. The major question of the series is: just how does one respond to this new world? From the perspective of a global crew and events that take place across the globe I think, at least on a subtle level the story does address the issue of privilege—a discussion between Mary and Ryan includes a rather good dialogue about American privilege in the world. Ryan, the American, when complaining about losing contact with the US is told by Mary, “This planet is dying, Ryan nothing is fair, what makes you think you’re so special?” Again, for the most part, so far in the story it is subtle, but it is there, and I think that is worth mentioning. To be a fair review I should list a few of my concerns with the book, although there are few. Like Brian Wood’s prior work, the story is centered around a fairly privileged white male, who in this case, is given a few characteristics to make him exotic. For some reason the idea of a white guy, born and raised in Bangladesh, who later becomes a mercenary, seems like a touch of lazy writing in an otherwise strong group of supporting characters. However I do suspect that as the series progresses we’ll see more stories centered around the other characters. More than a few clues suggest that Mary may become the real focus of the story and that is a tale I can’t wait to read. The other issue I take with the writing was discussed earlier and I wish a little more background research would have been done on the internal debates within the radical direct action community. This can probably be forgiven as there is still a lot of depth to the discussion and it is presented in a far more interesting and evocative way than it is in many other forms of mass media. So would I recommend this series? Yes, strongly. I think there are a lot of issues for anarchists, anti-authoritarians, radical environmentalists, and apocalypse junkies to think about. It should be noted that I may be a little biased—I am a sailor, and a former member of the Sea Shepherd crew. So take that into consideration, but I’ve encounter few overtly political comics which still tell a great story. Plus, I’m fairly happy with the degree of nautical accuracy. Brian Wood has started another great story, and if you enjoy The Massive I would strongly encourage you to check out DMZ and Northlanders. This volume is just beginning, and like Mary who “knew the sea still had use for her,” we can think about what we can do in a world in collapse as this story continues.